A study of human emotion, conveyed through facial expression, forms one of the most striking images of this year’s Degree Show at the University of Southampton’s Winchester School of Art. 1 year old Graphic Arts student Jade Davies studied her personal emotions at set times during one day, plotting facial data onto photographs of polystyrene heads, and then onto an actual dummy head. 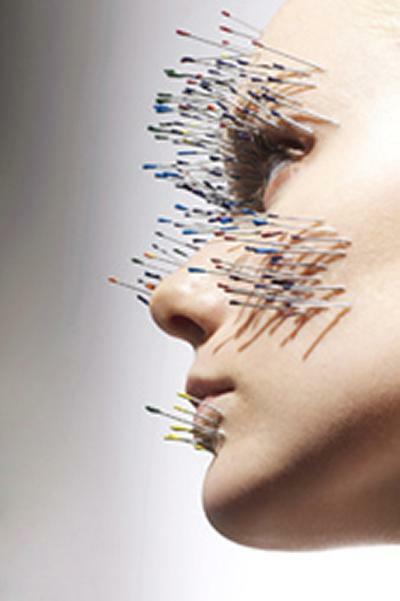 She used different coloured ‘pins’ to plot different core emotions, and the depth of the ‘pins’ to denote the intensity at which they were felt. Later, she represented this information on a real face. “The human face constantly conveys emotional information through facial expressions – providing an often unconscious window into the vast array of human emotions,” says Jade. Hundreds of pieces of art work will be on display at WSA’s annual degree show, which is open to the public between 17 and 23 June. The event at the Park Avenue Campus in Winchester, will showcase student work from Fine Art; Fashion and Textiles; and Graphic Arts. Fine Art work will also be on display at the Old Hyde Laundry building in Hyde Abbey Road. In addition, fresh from success at their London Show last week, fashion students are presenting over 50 collections at the Great Hall in Winchester on Thursday 17 June (2pm and 5pm). Students Hanyuan Guo and Samantha Bushell were both awarded prizes in London by top designer Peter Jensen for Fashion Design and Fashion Textiles respectively. Their work will be on the catwalk in Winchester, along with beautifully executed knitwear, sophisticated woven clothing and a visual feast of exuberant colours from other students. “Students and staff have once again raised the bar on the standard of the work across all disciplines. The Degree Show cements the School’s reputation as an international centre for ideas and I would welcome anyone to visit it on open days,” comments Head of School, Bashir Makhoul.